Cappella Cantorum offers an opportunity to win two tickets to the Broadway smash hit “Hamilton” when it plays at The Bushnell in Hartford in December. 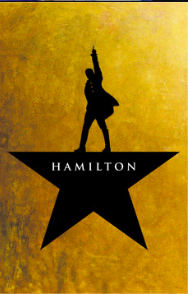 Through its Holiday Happenings Raffle Fundraiser, participants may win two seats to “Hamilton” as well as tickets to four other theater productions over the holidays. The four other prizes include a family four-pack of tickets to the “Wizard of Oz” at the Shubert Theatre in New Haven, a gift certificate for two to attend the Goodspeed Opera House in East Haddam, four tickets to “A Christmas Hour” at the Ivoryton Playhouse featuring Broadway star David Pittsinger and Patricia Schuman, and tickets to “A Connecticut Christmas Carol” at the Norma Terris Theatre in Chester. Raffle tickets are $40. The raffle will run now through Monday, Nov. 19, and tickets will be sold by Cappella members or on-line at CappellaCantorum.org. Only 500 tickets will be sold, so odds for winning are much better than for any lottery. Drawing will be Sunday, Nov. 25, 6 p.m. at the Ivory Pub and Restaurant, 1 Kirtland St., Deep River. Winners need not be present at the drawing. Cappella Cantorum is the valley-shore’s premier community chorus and has been performing great classical choral works with a professional orchestra for 49 years. Simon Holt is the music director. Its upcoming concert on Sunday, Dec. 2, will feature Puccini’s “Messa di Gloria” and Saint-Saens’ “Christmas Oratorio” and will inspire a holiday spirit. Check CappellaCantorum.org for details. For more information, call 860-526-1038.